Should I even watch this team? Basketball season is finally here, that can mean only thing the dreaded New York Knicks are in action again. The Knicks begin their season tonight against a familiar face in Oklahoma City. Carmelo Anthony will make his Thunder debut tonight against his old team. The Knicks do not have much expectations going into the season and all signs are pointed towards this season not being a fun one to watch. 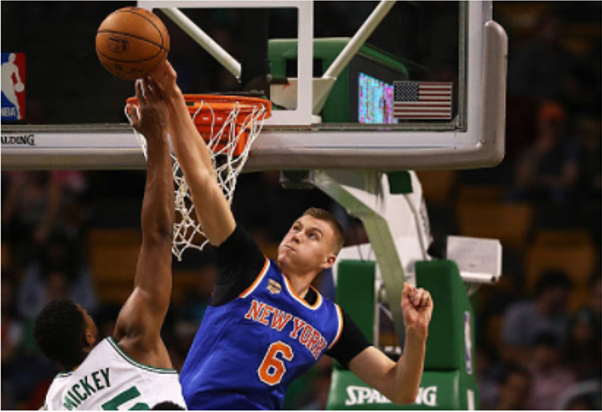 The Knicks are in the middle of a rebuilding process to get back to being contender for the first time since the turn of the century. They have some great core pieces in Kristaps Porzingis and Frank Ntilikina but have glaring holes, that other teams are going to exploit. Though this season should be playoffs or bust for the Knicks, I doubt the franchise looks at it that way. This season is about developing the young talent while acquiring more talent to continue growing their core. I will look at this season as a success for the Knicks if they are contention in March and if Porzingis takes the next step in his development. Porzingis had a great rookie season, but did not develop like he should have last season. It is now year three for him and its time for him to show that he should be the crowned jewel of the Knicks rebuilding process. If Knicks are semi competitive and Porzingis makes the All Star Game roster, then this season is a huge success. Knicks head coach Jeff Hornacek is a lame duck coach as he was hired by the previous management of Phil Jackson, who is no longer working for the Knicks. Hornacek could have been better in his first season coaching the Knicks last season and needs to improve if he wants to stick around after this season. The Knicks have a lot of young talent and Hornacek’s main focus should be developing that talent for the future. Even if the Knicks do not have a lot of wins, but the young players have progressed as expected, then the Knicks should bring back Hornacek. As I said earlier, this team does not have many expectations. They are in the first year of a new management structure which will take some to adjust. Even if the Knicks do patch together some wins, they are not going to win the championship, because the top two teams in the NBA are not even in the same league as the Knickerbockers. The Knicks should focus on developing talent so that they can get into the league of the Cavs and the Warriors in the coming years. My personal goal for the Knicks is to contend for the 8th spot in the East, even though they are going to get swept by the Cavs if they do get that spot, it will give their young players some valuable playoff experience. I do not expect the Knicks to make the playoffs this season, but I am also the same person that said the Yankees had no shot of making the Postseason and they are now just two wins away from the World Series, so what do I know. Crazier things have happened in the past and maybe the Knicks sneak into the playoffs and make some noise once they get there. All three people that read my blogs know that I am not a big basketball guy, so I have no idea how many blogs I am going to write about the NBA and more specifically the Knicks. My current plan is to do like a “State of the Knicks” blog on every Wednesday before doing more non-Knicks related NBA blogs once baseball season and football season end, but do not quote me on that. I have made a lot of promises about my blogs and I rarely follow through, shout out Show Review Saturdays and Sunday Stories.